However the more detailed projection line inevitable contains more chaotic movements, we should remember that. Timing Solution users can download the worksheet for this model (unpack this file into c:\TimingSolution\Work\ directory) here. 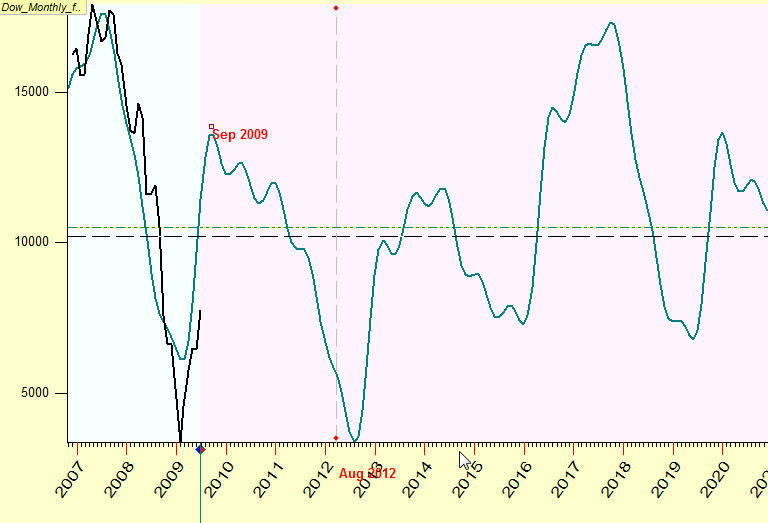 In reality the 2007 correction took place half year later than shown by this forecast; and it is much more deeper. This correction is called now Crisis 2007-2009 (I hope). 2) Simple models work better. 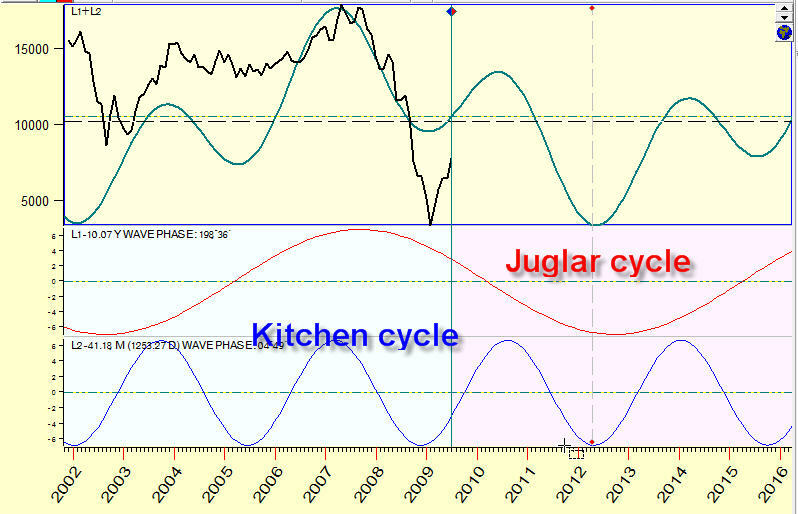 To make the forecast for this article I used two basic economical cycles, Juglar and Kitchen cycles only. I could easily apply not these two but dozen other cycles. I did not do that because I am not sure that these dozen cycles work in reality. In other words I prefer to use the cycles that I trust. Constructing forecasting models you should always remember GIGO principle ("Garbage in, garbage out"). 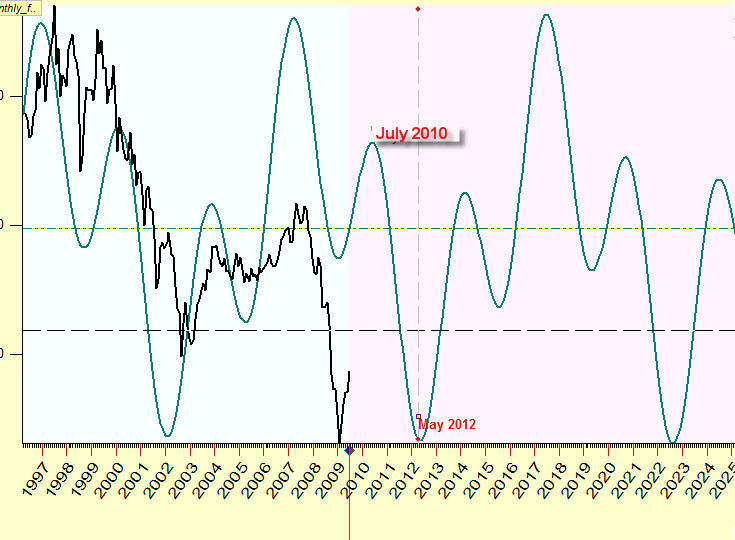 3) Even economical cycles should be considered as dynamic cycles. In other words there is no any cycle that works forever. The economical cycles have their own life. the amplitude, phase as well as the period of these cycles is constantly changing. So instead of inventing more and more new cycles I prefer to research in details the cycles that were investigated within last 150 years. For me the most intriguing of these two is Juglar cycle. It is presented practically in any financial data. It varies between 9-11 years. It is close to the Sun spot activity cycle. However it is definitely not the Sun spot activity cycle. 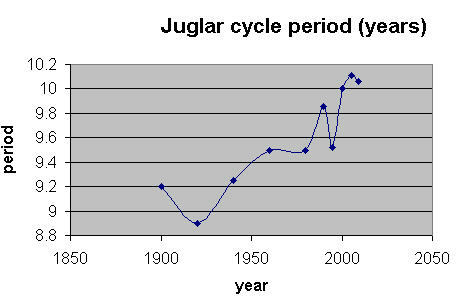 I tend to consider the Juglar cycle as GENERATION cycle. New generation brings new ideas; sometimes these ideas lead to bubbles, and the stock market crushes. We cannot help it, this is the life. The period of inventory Kitchen cycles varies in 38 months - 43 months diapason. I do not see any tendency to change for this cycle. I only see that this cycle exists. May be it correlates somehow with 4 years Presidential cycle (kind of the stock market's reaction to some political changes). The 8 months difference in the period of Kitchen (40 months) and Presidential (48 months) cycles makes some kind of dissonance between these cycles. Now I will show how these cycles work, the character of these cycles. The standard approach to do this is to analyze these cycles together with their overtones (Fourier analysis). You see there a steep decline in this curve (marked zones on the diagram above). In other words, according to this cycle, there are "crash" zones when the Dow drastically loses its value. I tend to consider this cycle as GENERATION + CRASH cycle. The new generation traders, economists, politicians are coming, they bring new ideas, stock market corrects these ideas and makes a room for new ideas. And the life goes on. The Kitchen cycle looks more harmonically.